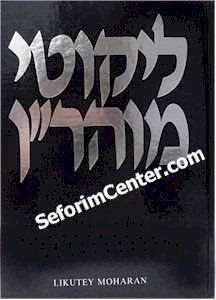 "The Collected Teachings of Rabbi Nachman of Breslov" is the most important collection of Torah teachings of the outstanding Chassidic luminary, Rebbe Nachman(1772-1810). It contains all his major Torah discourses given over the last eight years of his life together with many shorter lessons, transcribed and edited by his closest student, Reb Noson. Rebbe Nachman himself described Likutey Moharan as a work "for the great and small alike". The translation itself is clear and painstakingly faithful to the original, and is accompanied by facing punctuated Hebrew text, full source references, and an extensive commentary explaining the underlying ideas and broader meaning of the text. A work throwing light on the deepest concepts of the Torah, Kabbalah, revealed and mystical, Likutey Moharan guides the contemporary spiritual seeker around the confusions and deceptions of the modern world to faith, truth and devotion on his spiritual path. (Lessons 33-48). Presented with facing punctuated Hebrew text. ALL Seforim in Hebrew (A to Z), ALL Books of Kabbalah in English (sorted A to Z), All Chassidic Books (sorted A to Z), Rabbi Nachman of Breslov.., ALL English Books, Rabbi Nachman of Breslov., Rabbi Nachman of Breslov,, ALL (Sorted A to Z. ), Rabbi Nachman of Breslov (1772-1811).